[Fig. 2 and Fig. 3] Given all of this, it comes at some surprise, and perhaps at some relief, to learn that Still once tried his hand at interpreting another artist’s work, at writing art history, the very discipline he enjoyed lambasting as one giant “literary myth,”8 when he penned a Master’s Thesis on Paul Cézanne in 1935. 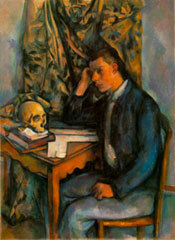 Still’s Thesis, entitled “Cézanne: A Study in Evaluation,” was, according to its title page, submitted “in partial fulfillment of the requirement for the degree of Masters of Fine Arts at The State College of Washington, Pullman,” where the artist studied from 1933-1935, and where art students were ostensibly obliged to produce a written qualifying paper in addition to their MFA studio requirements.9 This important yet continually overlooked document (it goes unmentioned, for example, in the immense catalog for the Philadelphia Museum of Art’s recent blockbuster exhibit, Cézanne and Beyond10), which remains buried in the Archives of American Art, deserves to be exhumed and more widely read – indeed, bringing its contents to light is one of the main raisons d’être of this essay. Somewhat surprisingly, it is a real page-turner, which proves, among other things, that in addition to being Abstract Expressionism’s most famous curmudgeon, Still was a formidable wordsmith and an astute critic. 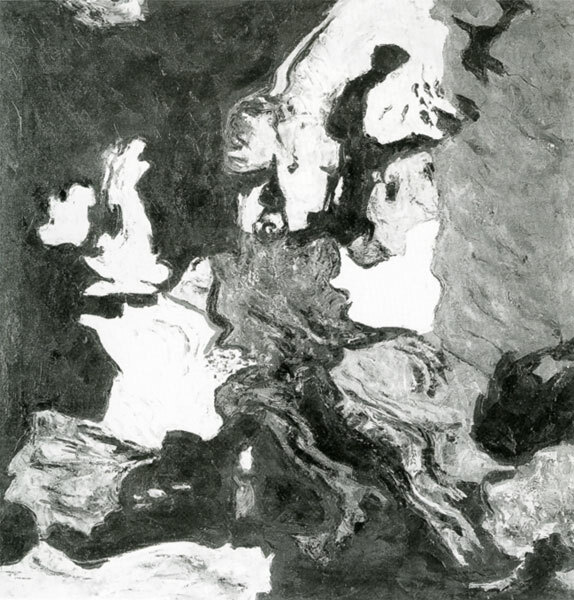 Moreover, judging from the Thesis’ appended bibliography it appears that Still, an artist known for his overt jingoism, chauvinism, and anti-Europeanism, possessed a truly international palette when it came to art historical scholarship. He consulted books and articles by Ambroise Vollard, Roger Fry, Clive Bell, Maurice Raynal, Joachim Gasquet, Leo Tolstoy, and George Santayana. [Fig. 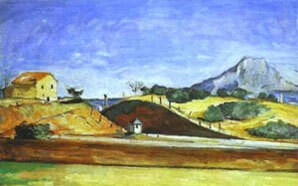 4] and Cézanne’s Railway Cutting (c. 1869) [Fig. 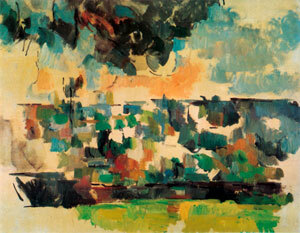 5]; Still’s Untitled (Indian Houses, Nespelem) (1936) and Cézanne’s Mill on the Couleuvre at Pontoise (1881) or Cézanne’s Oil Mill (c. 1872) (which was reproduced in Tristan Klingsor’s 1928 Cézanne, one of the books cited in Still’s Thesis); the exsanguinated figures in Still’s lost paintings from the mid-30s [Fig. 6] and those that frequently appear in Cézanne’s often violent early images, including Le Negre Scipion (1867) and Autopsy (1865) [Fig. 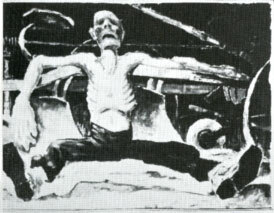 7]; the hollowed-out head in Still’s Untitled (1935) [Fig. 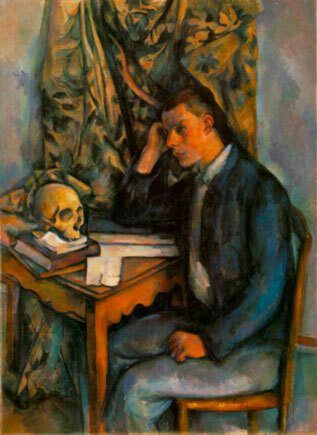 8] and the many skulls that populate Cézanne’s work from the mid-1860s forward, including the one found in Cézanne’s The Boy with a Skull [Fig 9], a painting specifically metioned by Still in his Thesis. The extant similarities found in these works challenge and complicate received notions about Still’s so-called Regionalist period and his purported blind adherence to the aesthetic ideologies of the movement’s most vociferous zealot, Thomas Craven, who he went out of his way to visit in the fall of 1934 after his stay at Yaddo, an artist’s colony in Saratoga Springs, New York.11 These works open up the possibility that Still’s mid-1930s paintings have more to do with his ongoing engagement with Cézanne’s legacy than they do with the reigning aesthetic concomitently promulgated by Thomas Hart Benton, Grant Wood, and John Steuart Curry. “the studio pattern-makers, the ingenious manipulators of lines and colors and theories, in fact, almost all the entire academy of modernism.”15 Implicitly, Still issues forth a challenge to his readers, then, as well as today: can we “estrange” ourselves, in the Brechtian sense, from what has become the institutionalized Cézanne? Can we see Cézanne’s works with fresh eyes, without looking at them though the distorting lens of Cubism, Expressionism, and Geometric Abstraction (as exemplified by the Bauhaus and/or Mondrian), which for Still constitute modernism’s three-headed Cerberus? That Still was able to accomplish precisely this, which is to say, develop a species of postwar abstraction not directly beholden to any of the major early 20th century Isms, may in fact be his biggest claim to fame. In “Still’s Writings and Late Work,” Chapter 7 of his unpublished 1984 doctoral dissertation written at the Courtauld Institute, David Anfam intimates at how the “authoritative and intermittently passionate tone” of Still’s thesis “does foreshadow future tendencies.” He also briefly considers the ways in which Still’s technical analysis of Cézanne’s work “anticipates important parts of [his] later artistic theory.”16 With the benefit of 30 years hindsight, it seems high time to follow Anfam’s lead and address the following related questions: To what extent did Still see himself as Cézanne’s ultimate “realizer?” What specific connection is there, if any, between Still’s Thesis on Cézanne and his later mature paintings? Or, put in slightly different terms, to what extent does Still’s Thesis on Cézanne contain the seeds of a theory of painting – an art, which, according to Still, is nothing less than an “instrument of thought”17 – that would, at a profoundly structural and conceptual level, continue to inform the artist’s practice in the postwar period? And, at the risk of overextending ourselves here, we might very well ask: to what extent does “Cézanne: A Study in Evaluation” shed light on Still’s ideas about how an artist’s work should be remembered, viewed, and experienced once he or she is gone? In other words, can Still’s thesis on Cézanne provide us with some insight into the latent hopes that he harbored for his own posterity, the afterlives of his paintings, and the role they should play in his own posthumous museum – his final, carefully-orchestrated, unifying work of art? Secondly, it can be argued, connections between Still’s postwar work and Cézanne are worth pursuing because the existing visual evidence impels us to do so. A side-by-side comparison of one of Cézanne’s late paintings, say for example, View of the Domaine Saint-Joseph, 1888-1890, a.k.a., La Colline des Pauvres (The Hill of the Poor) [Fig. 10], (which Still saw in person when he visited the Metropolitan Museum of Art in 1925), and one of Still’s mature postwar canvases, e.g. PH-589, 1959 [Fig. 11] immediately reveals certain affinities, many of which, to wit, are explicitly portended in the artist’s 1935 Thesis. First and foremost, there is the two artists’ similar application of paint, their undeniable raw facture, built up with a palette-knife in each case, which results in their shared craggy, scaborous surfaces. 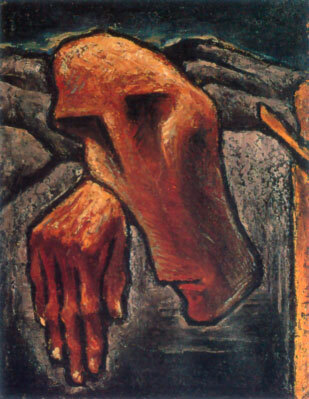 This is precisely what Still, in his thesis, describes as Cézanne’s “grim, almost brutal earthiness.”24 With their similarly handled surfaces, both artists sucessfully break down the division between the optic and the haptic, and manage, in the words of Yve-Alain Bois, “to splice viewing with touching.”25 In his thesis Still eloquently emphasizes Cézanne’s “tactual” application of paint and takes pains to describe the way his predecessor “feels” his way around his forms.26 Cézanne and Still similarly dismantle Albertian perspective by giving equal emphasis to figure and ground. Speaking about an unspecified Cézanne painting in his Thesis, Still demonstrates how “the mass of a parasol pine” in the foreground “is concieved primarily as a form that must above all else sympathize . . . with Mont Sainte Victoire in the background.”27 Still would certainly argree with Theodore Reff’s observation that in Cézanne’s paintngs: “verticals rest on the surface and never converge to a vanishing point . . . there are no orthogonals.”28 Evidence for this appears in the present painting by Cézanne, as well as countless others, including his House of the Hanged Man (1873), and those that purposefully contain geographical structures which, instead of moving away from the viewer and suggesting a horizontal register inside of the illusionistic space of the picture, form a façade flush with the two-dimensional surface of the canvas itself, e.g., The Bibemus Quarry (c. 1895), and Rocks at Fontainebleau (c. 1894-1898). The same effect can be seen in the faint blue trace found in Still’s painting reproduced above, as well as in his breakthrough mature works, especially, Jamais (1944) and Self-Portrait (1944). These paintings all contain thin, elongated forms which climb vertically instead of recededing toward a vanishing point, as would a depicted path or a winding road inside the picture’s ficticious space. And finally, we see in both artists’ works, especially in the upper left-hand corner of Cézanne’s painting (which the artist certified to his friends was indeed “finished”) the rejection of contour and the purposeful and strategic use of undeliniated forms that reach across sections of blank canvas or larger fields of color. Still accurately describes Cézanne’s open forms as having “ragged, detached edges,” and “varied and elusive contours”29 which play off of the empty sections of canvas inbetween them – the “contrasts” or “transitions,”30 as he refers to them. Still’s Thesis is divided into two main sections, a biographical preamble, and a technical “study in evaluation” of Cézanne’s method by way of a rigorous formal examination of a few select paintings. In the first section Still makes it clear that his return to Cézanne is motivated niether by naïve hero worship nor fashionable trends in current art historical thinking. He is well-versed in the game he is entering, and begins, following Maurice Denis, by admitting that Cézanne has already become a kind of modernist institution. Not surprisingly, it is precisely at this juncture in his Thesis that Still first begins to employ the terms “structure” and “organization” to illuminate the open-ended, ongoing operative strategy behind Cézanne’s lively fusion of the part and whole. 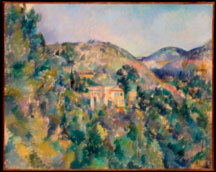 A full decade before Maurice Merleau-Ponty’s groundbreaking essay “Cezanne’s Doubt” (1945), wherein the French phenomenologist posits that the painter’s great achievement was to take into consideration “lived perspective” – as opposed to the idealized, decorporealized, and monocular system of perspective established in Quattrocento Italy – and to show “the birth of order through spontaneous organization,” Still insists on the importance of Cézanne’s “organization of sensations,” his perpetual “searchings,” and his “almost infinite readjustments, alterations, and modifications.”52 Above all, Still is attracted to the ways in which Cézanne renders complacent looking impossible, and how his viewer, in turn, is forced to participate in the artist’s organizational process, in the work’s structuring, and in the active unification the work’s parts (its “color-forms”) into a global compositional whole. “Went up to [Sidney] Janis’s gallery with Barney [Newman] the other day & took the liberty of pushing into the office to see some of the paintings you did this summer. What each work said, what its position, what each achieved you must know. But above all these details and attentions, the great thing, to see, came through. It was here a man had been at work, at the profoundest work a man can do, facing up to what he is and aspires to. Fig. 19 - Photo of Clyfford Still room at the Met (Clyfford Still Museum Website). paintings as it was a mid-twentieth century gesamtkunstwerk, a carefully orchestrated painterly-architectural-environment. Museum goers were asked to leave the rest of the museum behind as they walked into Still’s self-fashioned world, where one individual canvas led to and played off of the next, just as the individual color-forms inside one of Still’s painting conversed with others next to it, to create an overall effect. In the space of the exhibition, each painting went beyond its limits, expanded horizontally, and interacted as a whole with the other paintings on display. The interstitial blank walls of the Met’s galleries functioned like those sections of empty canvas found between color-forms in the majority of Still’s mature canvases. Greenberg’s description here is fascinating, not only because it proves that Still was right after all, his critics were “butchers” out to chop him up (! 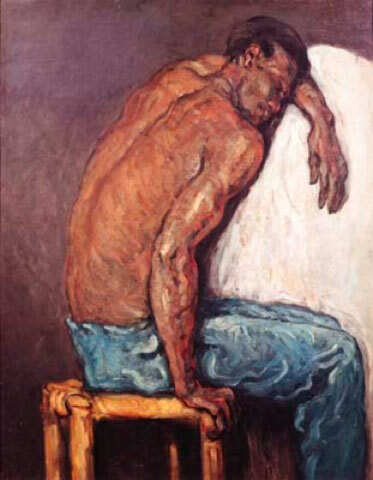 ), but also because as he focuses his attention on the Met’s catalog he simultaneously begins to describe Still’s great contribution to modern painting in terms of page layout – “Still’s originality lay, among other things, in his laying out, designing . . .” Greenberg implies that the novelty of Still’s painterly enterprise consists in his ability to carefully position his individual color-forms and canvases like words on a page, and by extension, to transform the space of the museum into a kind of book, written, designed, and layed out by the artist. The problem, according to Greenberg is that Still cannot control his “tightness of layout.”78 Just as the reproductions of Still’s paintings in the Met’s catalog do not stay on their individual pages, the artist’s canvases in the Museum’s gallery spaces refuse to stay in their alcoves and instead expand horizontally until they interact with others hanging close by. The museum as book which must be read in a certain way, written and layed out by the artist as (dead) author. Such notions suggest that there might just be conceptual side to Still’s oeuvre, and its afterlives. “The Western Round Table on Modern Art” a conference at the San Francisco Museum of Art, organized by Still and Douglas MacAgy, then Director of the California School of Fine Arts. Still chose to not participate but later went out of his way to defend those artists who did (i.e., Duchamp) against a host of hostile critics: “Never did I believe that such hatred of art and artists would be so publicly stated by the people who live on it,” he wrote afterwards. For Still, their negative comments amounted to little more than “Pedestrian verbage laid down by passing professionals.”79 Duchamp, like Still, had similarly started out his career devoted to the “cult of Cézanne,” as is evinced in his Chess Players (1911) [Fig. 20], before he decided to give up painting – because, he claimed, he “couldn’t stand the smell” – in favor of making ready-mades. 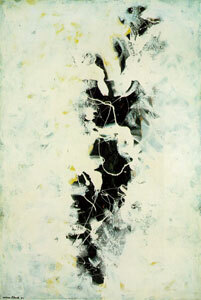 For his part, Still was not opposed to, like Duchamp, making replicas of his own work, and, lest we forget, in the postwar period Still played a central role in creating, along with Abstract Expressionism’s most conceptually minded adherents, Robert Motherwell and Adolph Gottlieb, The Subjects of the Artists in 1948. All of which perhaps explains why Still found it necessary to add the following qualification to the end of his aforementioned letter to the Editor: “Please remember I speak without rancor – I have known Duchamp personally and well for many years . . .When all the social platitudes and psychological clichés are forgotten the issues will become clearer. When all the work of our hands and minds have been sublimated to symbols the essence of our commitment will remain revealed in the pages of your magazine.”80 Still, conceptualist? Ultimately, an approach such as this could help us better understand the whole of his lifework and its realization in his one-man museum. Harry Cooper, Curator of Modern and Contemporary Art at the National Gallery in Washington D.C., has already provocatively described Still’s entire career as a kind of “thought experiment.”81 At the very least we should admit that Still, as curator Katherine Kuh has observed, was “fixated on the problem of posthumous fame” and spent a great deal of mental and conceptual energy trying to “outwit history”82 – and he did, to date Still is the only Abstract Expressionist who has his own room at the Met, and he is the first to get his own one-man museum. 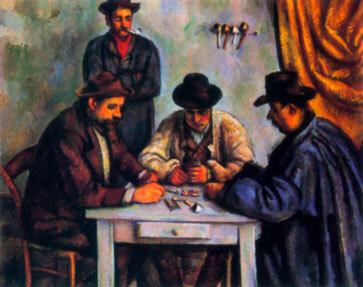 Near the end of his 1935 Master’s Thesis Still turns his attention to Cézanne’s Card Players (1892) (Metropolitan Museum of Art) [Fig. 21], a “mature and consumate” canvas that he clearly admires more than others. By way of conclusion, we can at this point begin to read between the lines and speculate on what it was about this painting that so intrigued Still. He is not interested, like Cézanne scholar Erle Loran, in in discovering a hidden structure underlying the tableau’s composition.83 Nor does he want to argue that this painting somehow paves the way for 20th century abstraction by illustrating Cézanne’s oft-quoted dictum stating that “everything in nature is a cylinder, sphere, or cone.” Still, in fact, couldn’t stomach this commonplace interpretation, which he refers to in his Master’s Thesis as an “academic platitude of prehistoric pedagogy.”84 Rather, we can begin to imagine that what fascinated Still about this painting was not so much what it shows or represents, but rather what it suggests at an operational and conceptual level. The model of the card game, I think, can ultimately help us theorize Still’s overall enterprise, lifework, and posthumous museum. It is a particularly apt model, especially if we think of the ways in which Still so deftly played his cards during his career (entering into and stepping out of the museum circuit and/or art market), at times showing his hand, at other times purposefully obscuring it (the same might be said about Still’s artistic “hand,” or application of paint, which paradoxically was at once highly expressive, yet detached and impersonal). 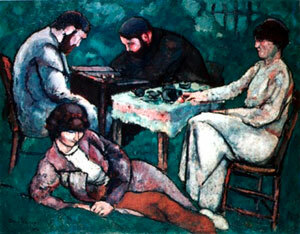 Any card game, like any painting, has two potential temporalities, one that is diachronic, and the other is synchronic – two poles which equate to the history of the game vs. the “presentness” of the match.85 Bridge, the game, for example, was invented at a certain place and time in history, which is to say in Russia in the late nineteenth century, and its rules evolved over time, on a diachronic vector. At some point it was decided that each player is only allowed a certain number cards at any given time, only so many “tricks” per play, etc. This is the history of the game. But a particular match of bridge between players always takes place in a perpetual present tense, on a synchronic temporal spectrum independent from the history of the game. Players must make the most out of the cards they have been dealt at that very moment, and plan, structure and organize their moves accordingly. Cézanne and Still, we might say, both do something similar to this when they organize the color-forms on their respective canvases. And, further, they ask the same of us when we look at their paintings; we must enter into the presentness of the match with them. Still, who was quite self-conscious of this synchronic, atemporal dimension, once said, “The only space and time I am conscious of in my work is the space and time in which they were painted.”86 His best works invite us to enter into the space of this perpetual present with him. In his book, Moves: Playing Chess and Cards with the Museum (1997), Hubert Damisch discusses the ways in which curators must “play cards” with the permanent collection of objects in their museums, endlessly reshuffling the same deck to create new relationships and make new thought-provoking connections between them. Their challenge, Damisch reminds us, is to “transform the museum into a laboratory -- at least into a place for experimentation;” to set up a “ludic” scheme which admits to the fact that a museum is at once a system and the product of a history, at once diachronic and synchronic, linear and simultaneous.87 In the postwar period, Still’s Oedipal rivalry with Cézanne resolved itself into a competition with himself, an ongoing game of solitaire, wherein he began to use his own paintings as readymade playing cards. 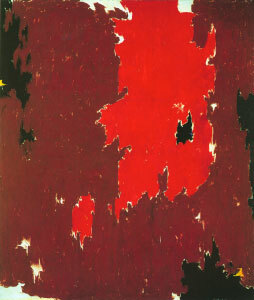 The Clyfford Still Museum, the gameboard, or more accurately stated, the gamespace where Still’s game of solitaire will continue to be played out, has been built, and its very stucture will allow for – all apologies to Greenberg – the horizontal interaction between one mature Still painting and the next. Fittingly, the Museum’s first floor includes an innovative, fully-visible “deep” storage system. Behind a wall of glass museumgoers can see Still's paintings arranged upright in front of them, on a series of sliding tracks, waiting like cards in a player's hand, for their chance to enter into the ongoing match upstairs in the galleries. 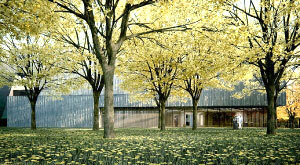 It remains to be seen if it will be possible for the Clyfford Still Museum to fulfill the utopian goals the artist envisioned, which is to say, if it will be a “place free of politics and academics,”88 and “a neutral environment which becomes whatever one chooses to make of it.”89 The “deck” of cards (or “set” of paintings) that Still left us will always remain the same, but the number of possible combinations of his individual canvases is forever limitless. This author, for one, is looking forward to playing cards with the artist in the years to come, ad infinitum, still. * The following is a revised version of an invited lecture I gave at the Denver Art Museum in 2007. I thank David Anfam, Ed Chung, Brian Norton Barkley Minturn, Richard Pate, Richard Shiff, and Dean Sobel for their helpful feedback along the way. Kent Minturn received his Ph.D. in Art History from Columbia University in 2007. He lives with his wife and son in New York City and is currently writing a book on Jean Dubuffet and postwar French literature. Clyfford Still, fall 1945, quoted in “Clyfford Still: Biography,” compiled by Patricia Still, in Thomas Kellein, ed., Clyfford Still, 1904-1980: The Buffalo and San Francisco Collections (Munich and New York: Prestel, 1992): 151. Clyfford Still, Letter to Betty Parsons, dated December 29, 1949. Ann Gibson, “Abstract Expressionism’s Evasion of Language,” Art Journal 47:3 (Autumn 1988): 208-214. These quotes come from Still’s “A Statement By The Artist,” in Clyfford Still: Thirty Three Paintings in the Albright-Knox Art Gallery (Buffalo: The Buffalo Fine Arts Academy, 1966): 16-18, save for the “hamburger” reference which appears in a letter Still wrote to Mark Rothko on April 20, 1949, reprinted in the “Introduction” to Still’s 1979 retrospective catalog (p. 26). Still’s ire was similarly directed towards literary critics, even though he had studied under one, Prof. Murry Bundy, while at Washington State College. Cf., Still’s reaction to Northorp Frye’s book on William Blake in a letter to his wife dated June 1954: “So the scholar makes his contribution to the mass of murderous knowledge and the creator is supplanted by the pedant and all his work negated or hidden from those who might have some desire to expereince it. He who does not send the inquirer to the original work is a thief, liar, fraud, a murdering dog.” (“Biography” p. 158). Clyfford Still, “Letter to Dorothy Miller,” in 15 Americans (New York: Museum of Modern Art, 1952): 21. David Anfam, “‘Of the Earth, the Damned, and of the Recreated’: Aspects of Clyfford Still’s Early Work,” Burlington Magazine 135:1081 (1993): 260-269. These quotes come from Still’s letters to Ernest Briggs dated July 12, 1960, and Mark Rothko, dated November 10, 1951. Both appear in John P. O’Neill, ed., Clyfford Still (New York: Abrams, 1979) pp. 42-44, and pp. 56-57, respectively. For more on Still’s estate and the legal issues involved, see, Ben Heller, “Art, Money and Law: Notes on the Clyfford Still Estate,” Art in America 78 (December 1990): 63-69. Clyfford Still, “Cézanne: A Study in Evaluation,” MA Thesis (The State College of Washington, Pullman, 1935). Joseph J. Rishel and Katerine Sachs, eds., Cézanne and Beyond (Philadelphia Museum of Art, February 26 2009 to May 17, 2009) (New Haven and London: Yale University Press, 2009). Although Still’s work was not displayed as part of The Baltimore Art Museum’s 2009 exhibit, Cézanne and American Modernism, the accompaning catalog does devote two pages to his 1935 Thesis on Cézanne. See Mary Tompkins Lewis’ contribution, “Epilogue: Cézanne and Abstract Expressionism,” in Cézanne and American Modernism, eds., Gail Stavitsky and Katherine Rothkopf (New Haven and London: Yale University Press, 2009): 125-139. Still’s handwritten letter to Elizabeth Ames, dated September 17, 1934, is reproduced in Micki McGee, ed., Yaddo: Making American Culture (New York: Columbia University Press, 2008): 68-69. In it he reports, “Before leaving New York I visited Mr. Craven at Great Neck. We talked for three hours and had lunch together. I found him generous and capable in his criticism and most kindly as a man.” However, it is not necessary to assume that they extolled the virtues of Thomas Hart Benton and Regionalism together, it is equally plausible they discussed their shared admiration for Cézanne, an artist to whom Craven devotes a large amount of time in both his Men of Art (New York: Simon and Schuster, 1931) (a book which appears in Still’s Thesis’ bibliography) and Modern Art: The Men, The Movement, The Meanings (New York: Simon and Schuster, 1934). Still, MA Thesis, p. 34. 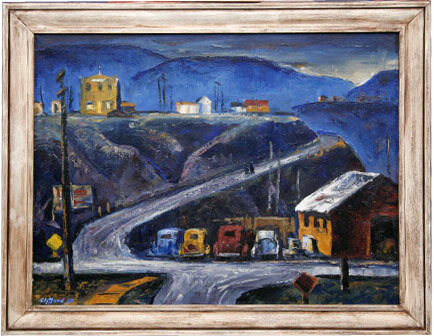 David Anfam “Clyfford Still,” unpublished doctoral dissertation (London: Courtald Institute, 1984 ©2001 David Anfam) pp. 39, 49 and 217-226. James Breslin has also briefly discussed Still’s MA Thesis on Cézanne in relation to his postwar abstractions in Mark Rothko (Chicago: University of Chicago Press, 1998): 226. Clyfford Still, “Letter to Gordon Smith,” dated January 1, 1959 and published in Paintings by Clyfford Still (Buffalo: Buffalo Fine Arts Academy, 1959): n. p.
Quoted in Nancy Marmer, “Clyfford Still,” Art in America (April 1980): 102-107, 112 (the quote is from p. 104). Clyfford Still, “Letter to Gordon Smith,” dated January 1, 1959, published in Paintings by Clyfford Still (Buffalo: Buffalo Fine Arts Academy, 1959): n. p.
Clyfford Still, letter to Clement Greenberg, April 12, 1955, Archives of American Art. Clyfford Still, “A Statement By The Artist,” in Clyfford Still: Thirty Three Paintings in the Albright-Knox Art Gallery (Buffalo: Buffalo Fine Arts Academy, 1966): 17. Stephen Polcari offers a different reading of this quote in “Clyfford Still: Of Plenitude and Power,” Chapter 3 of his Abstract Expressionism and the Modern Experience (Cambridge: Cambridge University Press, 1991): 91-116. Paul Cézanne, letter to Émile Bernard, October 23, 1905, quoted in John Rewald, ed., Cézanne’s Letters (New York: Da Capo Press, 1976): 316. For an overview of Abstract Expressionism’s relation to the late nineteenth century, see Robert Hobbs’ two articles: “A Concern With the Unknown Within,” in Abstract Expressionism: The Formative Years (Ithaca: Cornell University Press, 1978): 129-131, and “The Victorian Unconscious: Tonalist Sources for Abstract Expressionism,” in The Interpretive Link: Abstract Surrealism Into Abstract Expressionism (Newport Harbor Art Museum, Newport Beach, Claifornia, 1986): 47-50. And, Patrick McCaughey, “Clyfford Still and the Gothic Imagination,” Artforum 8:8 (April 1970): 56-61. Howard Singerman also reminds us that “Cézannism” had become a kind of academic cliché in the Westcoast art schools where Still taught in the immediate postwar period; the artist would have wanted to separate himself from Cézanne for this reason as well. See Singerman’s, Art Subjects: Making Artists in the American University (Berkeley: University of California Press, 1999): 132. Still, MA Thesis, p. 8. Yve-Alain Bois, “Cézanne: Words and Deeds,” October 84 (Spring 1998): 31-44 (p. 37). Still, MA Thesis, p. 18. Theodore Reff, “Cezanne’s Solids and Spaces,” Artforum (October 1977): 34-37 (p. 36). Still, MA Thesis, p. 20. Paul Cézanne, letter to Émile Bernard, May 12, 1904, quoted in John Rewald, ed., Cézanne’s Letters (New York: Da Capo Press, 1976): 302. Clyfford Still, quoted in the “Introduction” to Clyfford Still, ed. John P. O’Neill (New York: Metropolitan Museum of Art and Abrams, 1979): 24. There are numerous examples of this. The most trenchant is perhaps Still’s description of French tachist Georges Mathieu as a “parasitical tramp,” in his letter to the Editor of Artnews, April 1955. Quoted in J. Benjamin Townsend, “An Interview with Clyfford Still,” in Gallery Notes of the Albright-Knox Art Gallery 24:2 (Summer 1961): 13. Still, MA Thesis, p. 14. Clement Greenberg, “American-Type Painting,” (1955) in John O’Brian, ed., Clement Greenberg: The Collected Essays and Criticism, Affirmations and Refusals, 1950-1956 (Chicago: University of Chicago Press, 1993): 217-235 (p. 233). Still, MA Thesis, p. 16. Ibid, pp. 23 and 24. Rainer Maria Rilke, letter to his wife dated November 4, 1907, in Letters on Cézanne, edited by Clara Rilke (London: Cape, 1988): 97. Still, MA Thesis, p. 29. Mark Rothko, “The Romantics Were Prompted,” (1947), reprinted in Writings on Art (New Haven: Yale University Press, ): 58. Quoted in Patricia Still, “Clyfford Still: Biography,” p. 157. Kelly readily admits his indebtedness to Cézanne. 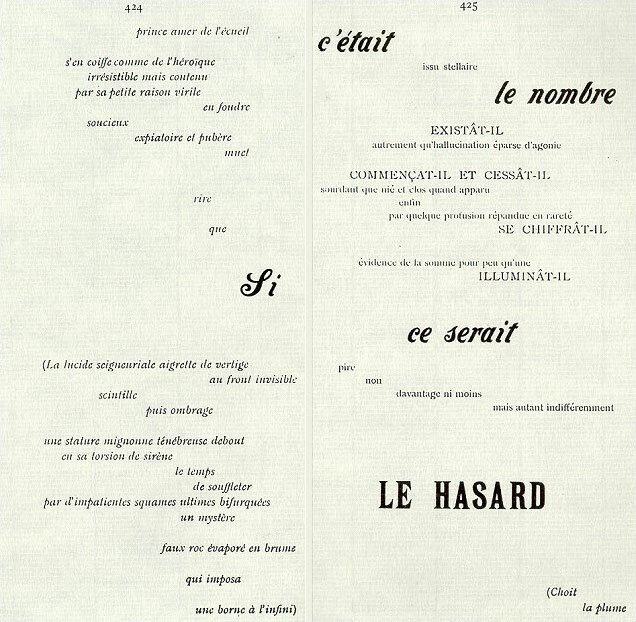 See, for example, his comments in the bilingual publication edited by Anne Hindry, Correspondences 24: Paul Cézanne/ Ellsworth Kelly (Paris: Musée d’Orsay, 2008). Hubert Damisch, A Theory of /Cloud/ (Stanford: Stanford University Press, 2002): 229. Robert Rosenblum, “The Abstract Sublime,” Artnews 64 (February 1961): 33-38; and Rosenblum, Modern Painting and the Northern Romantic Tradition: Friedrich to Rothko (New York: Haper & Row Publishers, 1975): 200-201. For example, while walking through his immense 1979 show at the Metropolitan, which represented only approximately one-twelfth of his paintings, Still quipped: “I could have chosen any other set.” Quoted in Nancy Marmer, “Clyfford Still,” Art in America (April 1980): 105. Claude Lévi-Strauss, The Way of the Masks (1975) (Seattle: University of Washington Press, 1982): p. 12. 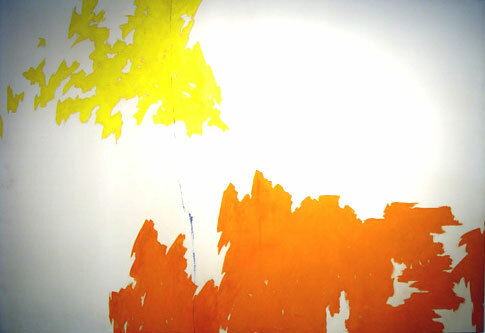 From Clyfford Still (Institute of Contemporary Art, University of Pennsylvania, October 18 – November 29, 1963): 9-10. Donald B. Kuspit, “Clyfford Still: The Ethics of Art,” Artforum 15 (May 1977): 32-40. Quoted in Steven Naifeh and Gregory White Smith, Jackson Pollock: An American Saga (New York: Haper Collins, 1991): 728. Pollock quoted in Sam Hunter, Masters of the Fifties: American Abstract Painting from Pollock to Stella (New York: Marisa del Re Gallery, 1985), n. p.
Naifeh and Smith, Jackson Pollock, p. 761. Thomas Albright, “A Conversation with Clyfford Still,” Artnews 75 (March 1976): 30-35; 33. Katharine Kuh, My Love Affair with Modern Art: Behinds the Scenes with a Legendary Curator, ed. Avis Berman (New York: Arcade Publishing, 2005): 197. 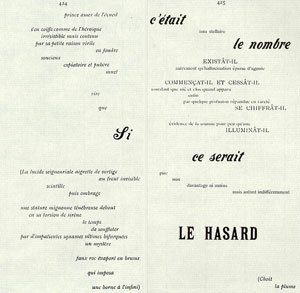 See, for example, Hubert Damisch, “Part and the Whole,” (1970), translated by Kent Minturn and Priya Wadhera, Art in Translation 4:2 (forthcoming 2012), Daniel Arrasse, Le Detail (Paris: Flammarion, 1999), the proceedings of the Fragment/Fragmentaire colloquium chaired by Louis Marin at the Centro Internazionale di Semiotica e Linguistica in Urbino, 1985, as well as Georges Didi-Huberman’s chapter cited in the following footnote. Georges Didi-Huberman, “The Detail and The Pan,” in Confronting Images: Questioning the Ends of a Certain History of Art (University Park: Penn State University Press, 2005): 229-271. 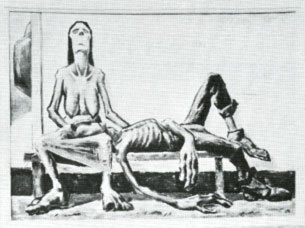 Still 1956, quoted in Nancy Marmer, ‘Clyfford Still,” Art in America (April 1980): 102-107, 112. Still, MA Thesis, p. 25. Clement Greenberg, “Clyfford Still,” in Late Writings, ed., Robert C. Morgan (Minneapolis: University of Minnesota Press, 2003): 121-131. Quoted in Still, “Introduction.” For the proceedings of this conference see, Robert Motherwell and Ad Reinhardt, eds., Modern Artists in America (New York: Wittenborn-Schultz, 1951): 30. Clyfford Still, “Letter to the Editor,” Artforum (February 1964), quoted in Calvin Tomkins, Duchamp. A Biography, (New York: Henry Holt, 1996): p. 438. Harry Cooper, “Still Against Himself,” Artforum 39 (Summer 2001): 150-155. Katherine Kuh, My Love Affair with Modern Art: Behind the Scenes with a Legendary Curator, ed., Avis Berman (New York: Arcade Publishing, ): 193. Erle Loran, Cézanne’s Composition: Analysis of His Form with Diagrams and Photographs of His Motifs (Berkeley: University of California Press, 1943). Loran also took an early interest in Still’s work. See his, “News From San Francisco,” Artnews 49 (October 1950): 52, 58-59. Still wrote a positive letter back to him dated March 20 1952, Archives of American Art. Still, MA Thesis, p. 12. Here I am following the argument put forth in Yve-Alain Bois’ “Four Angles,” the Introduction to Matisse and Picasso (Paris: Flammarion, 1999) and “Moves” in Artforum 36:4 (1997): 114. Also see Hubert Damisch, “La défence Duchamp,” [with discussion afterwards] in Duchamp, Colloque de Cerisy, July-August 1977 (Paris: Union Génerale d’Edition, 1979): 65-115; translated as “The Duchamp Defense,” October 10 (Fall 1979): 5-28. Quoted in J. Benjamin Townsend, “An Interview with Clyfford Still,” in Gallery Notes of the Albright-Knox Art Gallery 24:2 (Summer 1961): 11. Hubert Damisch, Moves: Playing Chess and Cards with the Museum (Rotterdam: Museum Boijmans Van Beuningen, 1997): 79-80. Clyfford Still, “A Statement By The Artist,” in Clyfford Still: Thirty Three Paintings in the Albright-Knox Art Gallery (Buffalo: The Buffalo Fine Arts Academy, 1966): 16-18. Quoted in Thomas Albright, “The Painted Flame,” Horizon 22 (November 1979): 34.